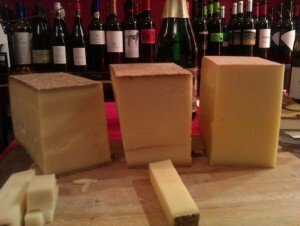 Eating Germany II: Bergkäse – mountain cheese calling! On the second leg of our Eating Germany tour, we go south, and we go cheese. When in Bavaria, forget the fairy-tale castle that is Neuschwanstein (all right, go, but after that) don your walking boots and discover new landscapes that are much more real! The local Käser and Hirten (or cheese-makers and herdsmen) are happy to talk cheese and cows. They have changed a bit since Heidi’s times – although this hugely successful children’s book from 1880 is set further south in the German speaking part of Switzerland, it belongs to the same cultural background as the German Alps and the Austrian Bregenzerwald. 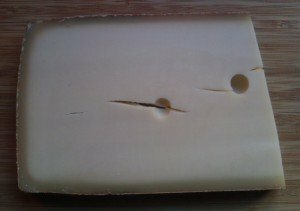 Mountain cheese is not a protected designation, but rather a type of large round hard cheese with almost no holes and an enticing nutty taste. That means that on one hand it can be produced without any significant altitude at its origin. On the other, Austria exports large amounts of it, and you’ll have no problem finding it at supermarkets all over Germany and by now also in some specialist stores in the US. The very best is produced in the summer months when the cows eat all those lovely herbs up on the steep meadows, while hay for the winter feed is made on the lower pastures. Instead of the old-fashioned goat herders and handmilking depicted in Johanna Spyri’s book, contemporary alpine dairies in the Allgäu region around Kempten are mostly well equipped with all modern amenities. Many cater for guests and feed you everything milky and cheesy, some even offer overnight accommodation. When I’m in the Allgäu, I always try to visit my friend Mathias Martin at Alpe Ornach above Bolsterlang. If at all possible I climb up the previous afternoon and bring my sleeping bag, as I love watching them at sunrise next morning getting the cows in for the milking. I find the scenario in the low wooden stable overlooking the mountains immensely peaceful: the warmth of the brown animals, the sound of their bells like a jam session of jazz and Indian music, and Mathias and his colleague Erwin quietly moving the milking machine from one cow to another. When all are done, the milk is heated in a big woodfired copper cauldron and Mathias adds rennet. While it sets to a wobbly jelly we have breakfast in the adjacent kitchen. Then Mathias and Erwin cut and stir the curd, finally lifting it out of the whey in large cheese-cloths. The white embryonic cheeses then sit under the press in large round moulds until the next morning. This is followed by one or two nights immersed in brine, before they join the previous production on the wooden shelves of the ripening cellar. 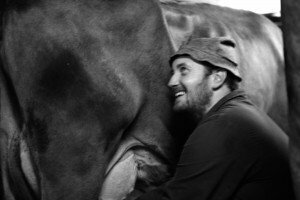 For me it’s a holiday, whereas Mathias and Erwin live to this rythm everyday for about three months, including the cleaning of the stable and the dairy, the changing of the pastures’ fencing, the evening milking… it is a lot of work. When Mathias takes me down into his dark, moist ripening cellar underneath the dairy and cuts one of his cheeses from the previous year, we both inhale the dense, almost fruity aroma, and I can see from the look on his face that he loves this life. Like most alpine dairies he sells cheese and butter to whoever happens to pass by (don’t worry, there is a lift), as well as small snacks and drinks. Besides cheese, ham and air dried sausages are on the menu. Like many of his colleagues, Mathias keeps a few pigs who are avid consumers of the protein rich whey left over from cheesemaking. On my walk down after lunch – when I’m lucky Mathias’ wife Marion is around and makes wonderfully cheese-oozing Kässpätzle, or cheese noodles – my rucksack is loaden with goodies to take home. Lovely blog entry. The kind of place worth to travel to. And I totally agree with you: Cheese and wine are a perfect match! Let’s just say there is a wine for every wonderful cheese. (but a good Riesling it’s of course a nice option). Thanks for sharing!